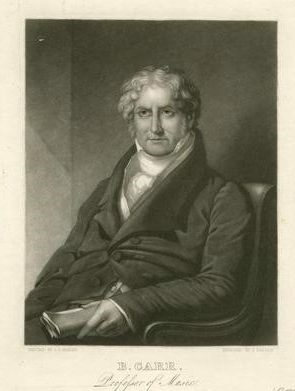 Benjamin Carr, depicted in this engraving by John Sartain, was a composer, organist, and music publisher. Born in London in 1768, Carr moved to Philadelphia from England in 1793. During his time in Philadelphia he became one of the most important music publishers in the United States. Carr composed and published the “Federal Overture” between 1794 and 1795. Carr quoted the tune “Yankee Doodle” in the “Federal Overture,” the published version of which included the first printing in the United States of that perennially popular tune. Carr was the organist at St. Augustine’s Catholic Church in Philadelphia from 1801 until his death in 1831. Sheet Music for "Hail, Columbia"
Benjamin Carr published the original instrumental march version of the “President’s March” in 1793. 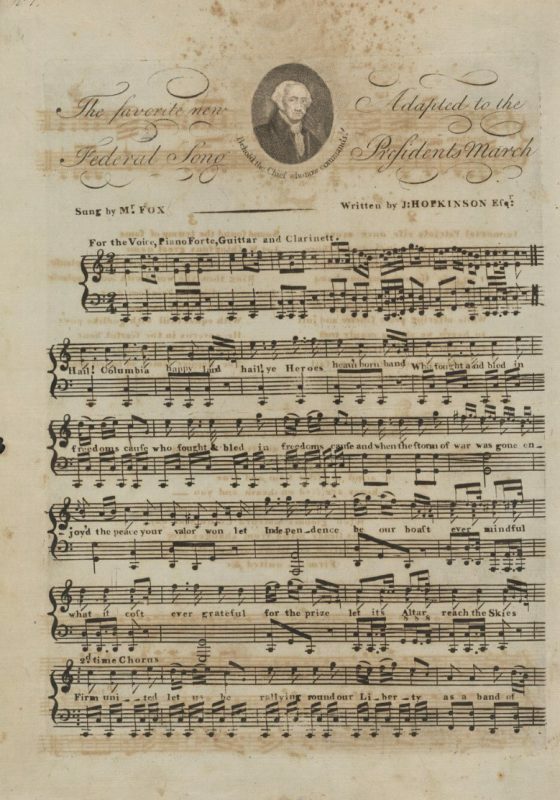 Joseph Hopkinson wrote lyrics and set them to the "President's March" music, and the first published sheet music of the tune as the song “Hail, Columbia” came in 1798, the year of the Library of Congress copy shown here. Unlike other early patriotic songs such as “The Star-Spangled Banner,” both the melody and lyrics of “Hail, Columbia” were composed in the United States. The first performance of "Hail, Columbia" took place at the Chestnut Street Theatre, on the right in this 1800 engraving by W. Birch & Son. The public first heard the song when a young singer-actor named Gilbert Fox asked Joseph Hopkinson to write a song for him to perform at an upcoming benefit concert in Philadelphia. Fox performed it at the Chestnut Street Theatre on April 25, 1798. The audience loved it and demanded multiple encores. A Philadelphia music publisher issued a sheet music version a few days later and the song quickly became very popular in both Philadelphia and New York. 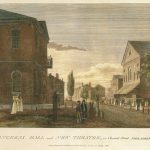 Completed in 1793, the New Theatre, later called the Chestnut Street Theatre, was established by actor Thomas Wignell and musician Alexander Reinagle. Modeled after a lavish English theater, it quickly became the fashionable theater of the city. 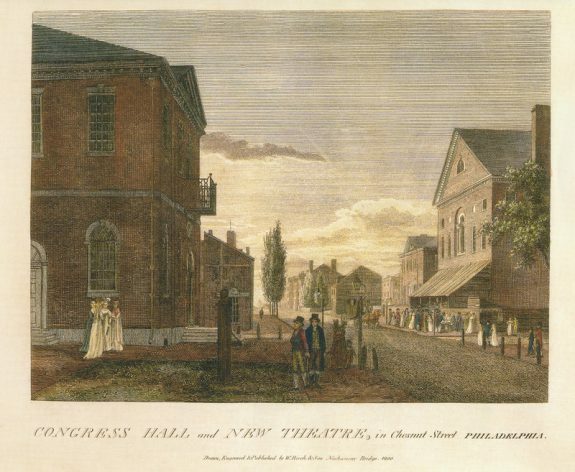 The building in the left foreground is Congress Hall, which was completed in 1789. “Hail, Columbia,” written in Philadelphia in the closing years of the eighteenth century, became a popular patriotic song in early America and served for many years as the unofficial national anthem. Bands began to play it in honor of the vice president of the United States in the 1830s, and later it became the official song of that office. Philadelphia lawyer Joseph Hopkinson (1770–1842) created “Hail, Columbia” in the spring of 1798 when he put lyrics to the tune of the “President’s March,” a patriotic instrumental piece written in 1789 by Philip Phile (1734?–93), a German immigrant musician active in Philadelphia in the 1780s and 1790s. In his later years, Hopkinson related the story behind the song: In April 1798 a young singer-actor named Gilbert Fox (1776–1807?) asked Hopkinson to write a song for Fox to perform at an upcoming benefit concert in Philadelphia. Fox needed a rousing song for the concert and asked if Hopkinson could write lyrics to Phile’s “President’s March.” Hopkinson obliged and came up with lyrics that opened with the stirring proclamation “Hail Columbia, happy land! Hail, ye heroes, heav’n born band.” With Philadelphia then serving as the nation’s capital and the United States on the verge of war with France, Hopkinson envisioned the song as a patriotic rallying cry. The public first heard the song when Fox performed it at the Chestnut Street Theatre on April 25, 1798. The audience loved it and demanded multiple encores. A Philadelphia music publisher issued a sheet music version a few days later and the song quickly became very popular in both Philadelphia and New York. Unlike other early American patriotic songs such as “The Star-Spangled Banner” and “America (My Country Tis of Thee),” which featured new lyrics set to traditional English melodies, both the words and music to “Hail, Columbia” were written in the United States. Philip Phile, who wrote the tune, first appears in the mid-1780s as a performer, composer, and music teacher in Philadelphia and New York. In 1785 he led the orchestra at Philadelphia’s Southwark Theatre. He wrote the “President’s March” in 1789, reportedly in honor of the presidential inauguration of George Washington (1732–99). Philadelphia music publisher Benjamin Carr (1768–1831) first published the piece in 1793. Phile died later that year in Philadelphia, perhaps a victim of the city’s infamous yellow fever epidemic. Joseph Hopkinson, son of well-known Philadelphia patriot and signer of the Declaration of Independence Francis Hopkinson (1735–91), was a prominent lawyer who later served as a U.S. congressman and federal judge. Joseph followed in his father’s footsteps in mixing law, statesmanship, and the arts. Francis Hopkinson, in addition to being a lawyer and judge, also became well known as a poet and musician. Considered America’s first “Poet-Composer,” Francis Hopkinson was the first native-born American to write a popular song, “My Days Have Been So Wondrous Free,” composed in 1759. “Hail, Columbia” remained popular through the centuries and was one of several songs that served as an unofficial American national anthem until Congress officially gave that designation to “The Star-Spangled Banner” in 1931. Written in the new nation’s first capital during a formative period in American history, “Hail, Columbia” was one of the first pieces of music to define the young United States in song. Later, as the official song of the vice president, it continued to play a role in America’s musical identity. Drummond, Robert Rutherford. Early German Music in Philadelphia. New York: D. Appleton & Co., 1910. Hart, Charles Henry. “‘Hail Columbia’ and Its First Publication: A Critical Inquiry.” Pennsylvania Magazine of History and Biography 34, no. 2 (1910): 162–65. Sonneck, Oscar George Theodore. Library of Congress Report on The Star-Spangled Banner, Hail, Columbia, America, Yankee Doodle. Washington, D.C.: Government Printing Office, 1909. Sonneck, Oscar George Theodore. “The First Edition of ‘Hail Columbia. '” Pennsylvania Magazine of History and Biography 40, no. 4 (1916): 426–35. Very interesting article. Thank you. To add a bit more, I believe that Phile was a Hessian bandsman, captured at Trenton, exchanged, who then deserted in 1783, and remained in Philadelphia. Unfortunately, I can’t locate my source. Bill: Thanks for that very interesting info on Philip Phile. If you ever locate your source for it, please let me know. It would be great to document that fact and incorporate into the story. I was finally able to do some more searching re: Phile (also Pfeil). I couldn’t find my original source, but here are two from the Journal of the Johannes Schwalm Historical Assoc. The first is from Vol. 3, #1, 1985 that lists Philip Pfeil as an oboe player attached to the Kynphausen Regiment and captured at Trenton. This is a list of all Trenton prisoners. I have a copy of this. I have not seen this one, but I’m quite certain this is your man. Good luck. It is also contended by a number of sources on early Philadelphia music that Philip Roth was the composer of the President’s March. He was another German so prevalent in the North Mulberry ward where he served as the musician for a Philadelphia Co. militia artillery unit after serving before the war as “Master of the Band of Music” from the Royal Regiment of British Fusiliers. He was a cohort of Philip Phile’s and most probably worked with him often as he was connected with the Old Southwark Theatre at the same time as Phile. They specifically played together at Vauxhall at Harrowgate in early June of 1792.